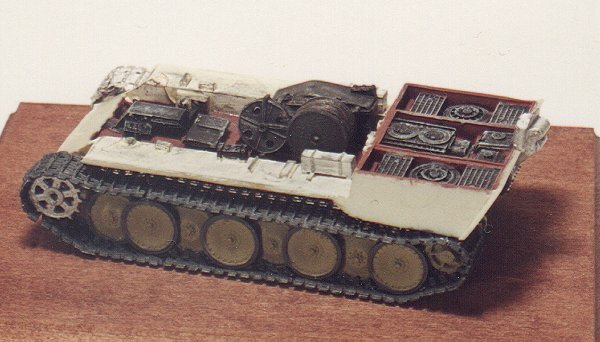 One of the bitter lessons that the Wehrmacht encountered at Kursk was that they could no longer count on holding the battlefield and recovering their damaged tanks and vehicles at leisure. This problem was compounded by the size and weight of the new Panther and Tiger which were rolling off the assembly lines. Three Famo recovery vehicles were required to salvage one Tiger under ideal conditions, and Famos were always in short supply and vulnerable in battlefield recovery situations. Part of the answer was the Bergepanther. Appearing soon after the introduction of the Panther, they were based, initially, on "ausf D" vehicles returned to the factory for repairs. The turret was removed, a lightly armoured box with folding wooden sides was added, and a whopping big winch (windlass) was placed in the fighting compartment. The Bergepanther was capable of a 40 ton straight pull or, using mechanical advantage and a spade attached at the rear, 80 tons. To all accounts, this was an extremely successful conversion, although there were never enough to go around. Fine Scale Factory, a producer of extremely nice and often exotic small scale armour, provided this kit to Doug Chaltry for review on his site "On the Way!" To my great delight, Doug passed it to me to take a look at. Here is what I found. As you will note from the photo, this is not a kit where you give the box a shake and out pops a finished model. 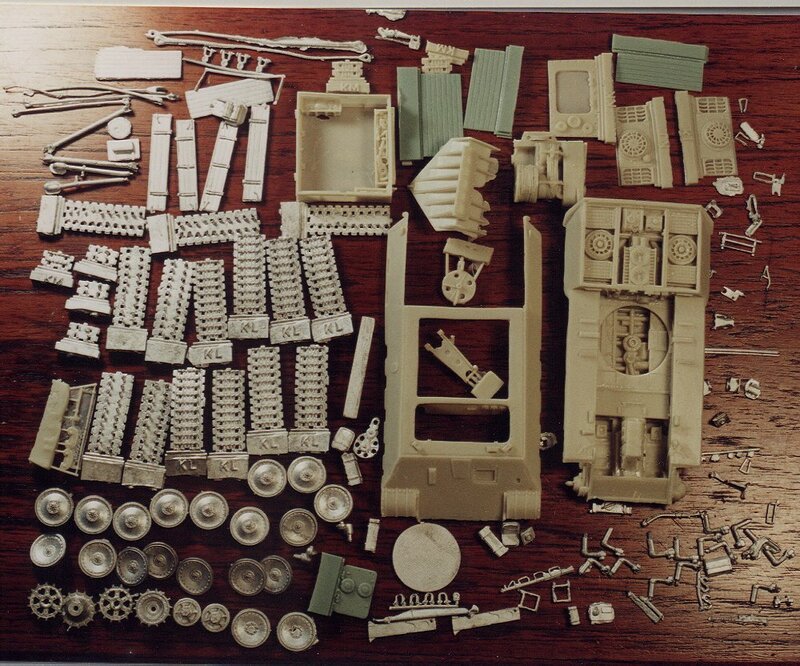 It has a massive number of parts, moulded in beige resin and metal. Parts are contained in three zip lock bags, two for metal parts and one for resin. The kit comes in a sturdy card board box with shredded newspaper for packing. I noticed only one minor bit of breakage (a crack in the box structure) but this was not a problem to fix. A photocopied sheet of instructions is included, with a short description (I think) in German and a number of "exploded" views. The kit is extremely well detailed, with full interior and a lot of small "bits and pieces". There is some resin flash to be trimmed off, however in a number of cases, such as the opening for the main compartment, the engine compartment or the driver's area, this is done on purpose to avoid, I assume, breakage of the hull. The smaller metal parts have a considerable amount of flash, which tends to be thicker and harder to remove. The tracks, moulded in white metal, are really very nice - well detailed with teeth on the inside. They do not seem to be a recast of the Revell tracks, although they may be based on them. The upper hull would seem to be based on the ESCI Panther ausf A with considerable work done to it. This has always seemed, to me, to be a bit wide, making the angled sides look slightly "off" - particularly when compared to the Revell or Hasagawa Panthers. I didn't think this would detract from the overall model however. The lower hull is quite beautiful, with the interior moulded in place. The engine, transmission and main work area, where the winch will go, is well cast. The fire walls are detailed as well. My copy seemed to have an ever-so-slight misalignment that made the engine compartment look slightly askew compared to the rest of the hull, however this could just be an optical illusion. Let me state my prejudice right off, I don't like working with metal. Part of this is bad experience with metal kits in the past and part of it is simple inexperience with the medium. It should come as no surprise, therefore, that I had trouble with the all metal running gear of the kit. When I first sat down to work on the kit, I was convinced that I was missing parts. There were nine outer wheels, eight middle but only two inner road wheels. A quick check of the instruction sheet showed that it included full inner wheels but then I came to the realization that the instructions for this section were just a cut-and-paste of the Revell kit instructions. In fact, when I began to dry fit the wheels and their torsion bar extensions (more about these later) I realized there was really no way you could fit inner wheels on. FSF had realized this (I assume) and only included inner wheels for the very last position, where they might show. This was not reflected in the instructions. This issue resolved, I trimmed the white metal crank-shaped torsion bar extensions and began happily super gluing them in the holes provided on the resin lower hull. I then realized that all of the torsion bars provided were the same size. I would have to cut half of them down to accept the middle road wheels, which I did. However, once all the cranks were on and I began to try to add the wheels, I found the joint between the resin and the metal wouldn't hold as I pressed the wheel on. I attempted to rectify the situation by swearing at the model and supergluing my fingers together, all to no avail. I then pulled off all of the cranks and glued them instead to the wheels first. I still had the same problem of attaching them to the resin hull, but I could cheat by also gluing the inner side of the outer wheels to the face of the middle ones. This inelegant approach seemed to work although I wouldn't want to try dropping the model very hard onto a table. Some of you may be wondering "Why is he using super glue instead of two part epoxy?" The answer is, I never thought of it. I can, however, recommend not using super glue. With the road wheels in place (I left the drive and idler wheel off, knowing I would have to bend the metal tracks around later), I turned to the tracks. Here lies a problem. The lower hull is moulded with the hull overhang in place. 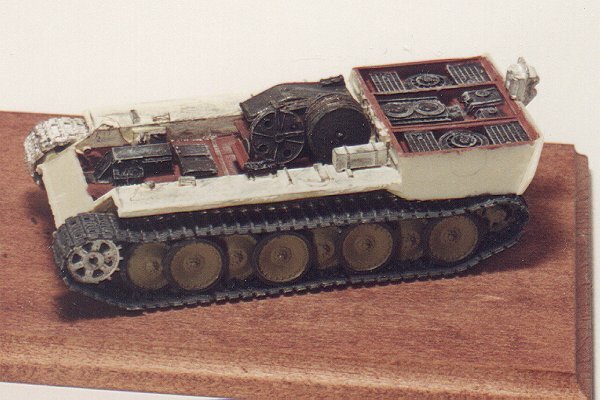 Revell got around this by having the track assembly as a separate unit which you slid up to the overhang once all the tracks were on. FSF requires you to put the upper tracks on by sliding them into place sideways - an extremely difficult trick given the nice teeth on the inside of the track. I accomplished this by carving off the inside inner teeth - where they would have to slide over a road wheel - and jamming them into place. I next turned to the drive wheels and idlers. The metal track bent around the idlers very nicely, although the teeth kind of bunch up. The drive wheel was a different story. There must be some way to fit the track over the teeth but I couldn't seem to do it. I ended up carving the teeth off and then bending the track around (the coward's way out). I figured I could fix any problems by using mud (the other coward's way out). Having done this, I was able to finish the tracks with a minimum of trimming and fudging. A couple of nasty gaps magically appeared once I was finished but, hey, that's what mud is for, right? (see Coward #2, above). As well, because of the eyeball method of sizing the torsion bar extensions, my drive wheel ended up to close to the hull side. I had to carve the tracks a bit to get them on the front. The result is, from the front, the tracks look just a bit "pigeon toed". Having bodged my way through the running gear, I now heaved a sigh of relief and started on the "real" model. I decided to go with an approximation of red primer for the floor and half-way up the sides of the vehicles interior, and the engine compartment. The rest of the sides I painted ivory. I then dirtied it up using a dry brushing of black and some lead pencil work. The transmission and radio I did in coal black (slightly shiny) since apparently that was common on German vehicles. The engine I finished in flat black. All the black items were then lightly dry brushed with light grey to bring out the detail. The winch, which is a beautiful moulding, was finished in a similar fashion, with the cable picked out in dark grey with highlighting of orangey red to simulate rust. I then turned to the instructions to start figuring where all the little metal parts should go ... hmmmm. In the original copy of this document, it may have been clear i) which part was which, and ii) where all those little arrows were going, but in my copy the instructions weren't much help. For example, in the engine compartment there were a couple of little do-hickies which were labelled something like "kuhlwasser something". However, the picture gave me no hint about what parts might form the water cooler thingie and absolutely no clue as to where they might be stuck. I decided to leave them off, since I was building the engine hatches closed (a shame really). This pattern was repeated everywhere - an indistinct picture of a part with an arrow disappearing into the picture of the kit. For exterior detail, there are at least a number of good references (Squadron's Panther in Action is one) and there are a couple of 1/35th Bergies displayed on Track Links which can be studied. The only place I had real trouble with was attaching the spade. This is a very complicated assembly which requires considerable thought and testing. In dry fitting the rest of the parts, I came across a little problem with a tool bin fixed to the inner side of the box structure interfering with one of the wheels of the winch. Maybe I got it wrong, once again the instructions are not much help, but I had to carve away part of the box to clear the winch. As you can guess from the photos, I have not yet completed the kit. I will add a "Bergie Part II" article when things are complete. My overall impression of the kit is that it is an absolute "tour de force" of multi media kits. Despite the criticisms I have made above, my feeling is that this kit will look fantastic when it is complete. It is, however, not for the inexperienced or the faint of heart. It also requires a considerable investment of time. To bring the Bergepanther to the state shown in the photos took approximately 20 hours (not including ungluing my fingers). This is far more than I usually spend. Finally, this is not an inexpensive kit. I have seen it advertised in the US for around $35 US. This price reflects the high quality and detail of this kit, but quite a chunk of change, even for a resin kit. Panther In Action, Bruce Culver, Squadron/Signal Publications, Carrolton, TX.